It is often said a family that eats together, stays together, and that's why the dining room is an important space in your house. 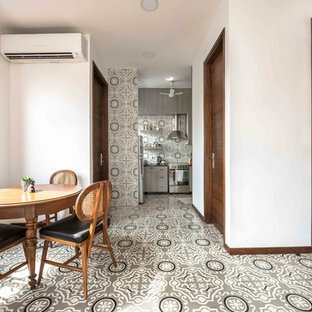 The dining area is typically attached to the living room or kitchen and bustling with activity, sometimes doubling a prepping zone or homework/reading space. 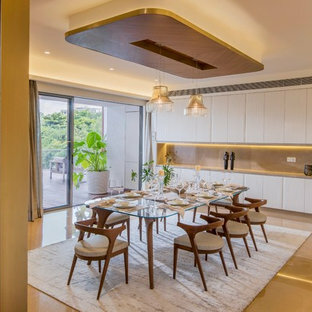 So while multifunctional dining room designs can be a little tricky, you should always start by picking a simple design that not only accommodates these everyday activities but is elegant enough host large get-togethers, family dinners and celebrations. 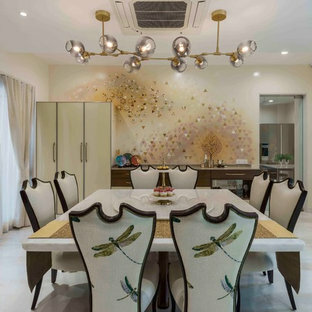 Dining room ideas can range from the dramatic overhaul of layout, walls, doors, or lighting, to the refresh of smaller details such as cutlery, chair covers and small decorative features. An easy way to start planning the revamp is by exploring dining room images. 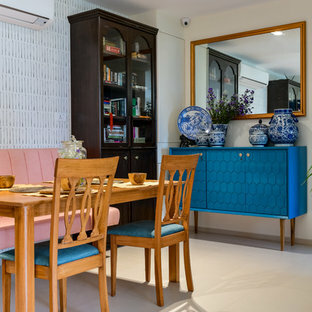 If you are looking to simply spruce up the dining room, then the easiest upgrade you can make is updating your furniture; after all, it is the focal point of the room. Take time to consider which dining room furniture pieces work best for your needs. Don’t be afraid to splurge — a good table can last you decades! Once you have this cornerstone piece figured out, you can then focus on the dining room ceiling lights, decor and storage options. What kind furniture should my dining room have? The centrepiece of any dining room is the furniture. The dining table has to be a balance between form and function. Just like dining rooms the tables also come in various shapes and sizes. 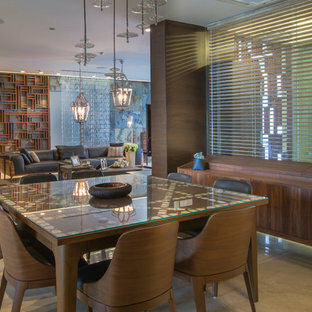 Ask yourself a few questions before you set out to buy a table: What is your dining area layout? How often do you entertain? How many guests usually attend? The answers will help you make some decisions on the shape and material. For example, round tables are optimal for smaller spaces. They fit into tight areas and have no sharp corners. While a larger space can accommodate a square or rectangular table. For dining room designs with long, narrow spaces the best seating option is the bench. The bench is functional, stylish and comfortable. For colourful dining room ideas, you can experiment with the chairs. Use bright coloured chairs or patterned upholstery to add an additional colour splash to the room. How do I add storage to my dining room? When picking out dining room storage pieces, think about functionality. Are you adding additional storage, displaying some dinner sets and fancy china or simply looking to lay out more food? If you would like to invest in something that serves more than one purpose, go for sideboards - a long, low storage piece with short legs (also known as a “buffet”) that typically comes with drawers or cabinets. They are ideal if you're looking for extra storage and a place to lay out some extra dishes. If you would like to just display or store your items, go for cabinets that fit your dining room design. Also, if you’re going to be using your dining area for cocktail hour (or even if you’re not), consider investing in a rolling bar cart or a bar shelf. Your bar items deserve to be displayed well even in storage. How do I decorate my dining room? 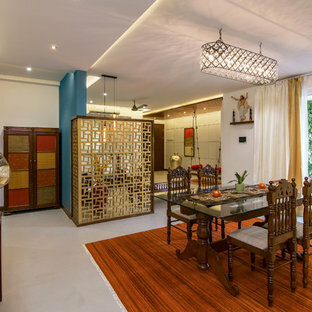 Like in most Indian homes, if your living room and dining area share a space, picking out decor can be difficult. Start by conjuring up the space using monochromatic colours in both the living and dining room so they blend well with each other. 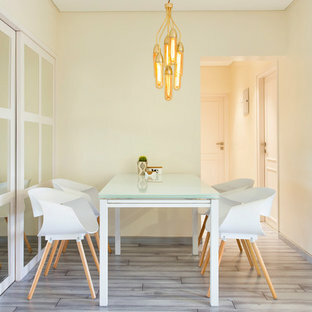 To break the monotony, work with metallic accents, geometric patterns, custom paintings and unique dining room wallpapers.If you have a large dining table then be sure to bring in some interesting light fixtures like a few hanging bulbs, maybe a chandelier, or a couple of artsy lampshades. Lastly, don’t forget to add a centrepiece, table runner or plant arrangement to help finish the look of your dining room. 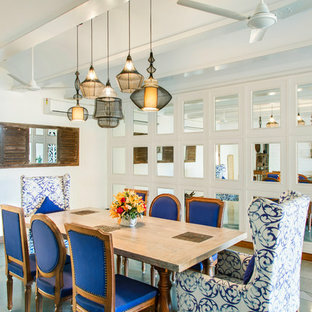 we have designed it with low lying light contemporary fitting above the dining table, provided wooden deck for formal Indian type seating ambience for heart to heart talks. 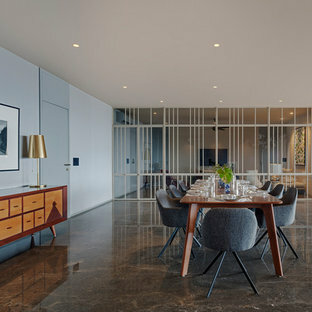 A Dogwood tree is in the center of the house, of which the dining room (left), kitchen (right), and living room (background right) all circulate around. This internal courtyard is quite dramatic to watch change throughout the seasons and weather.